After more than three decades of pioneering and innovative experimentation, mobile PCs have finally reached the mainstream. During the first half of 2008, consumers and employees acquired as many mobile PCs as desktops. News flash: even more recent updates to this information are available to subscribers to the full Technology User Profile service, the TUP Overview Report, and other TUP Profile Reports. For examples of mobile market questions answered by TUP, refer to the TUP Answers page for Mobile Computing. and the TUP Answers page for Mobile Phones. 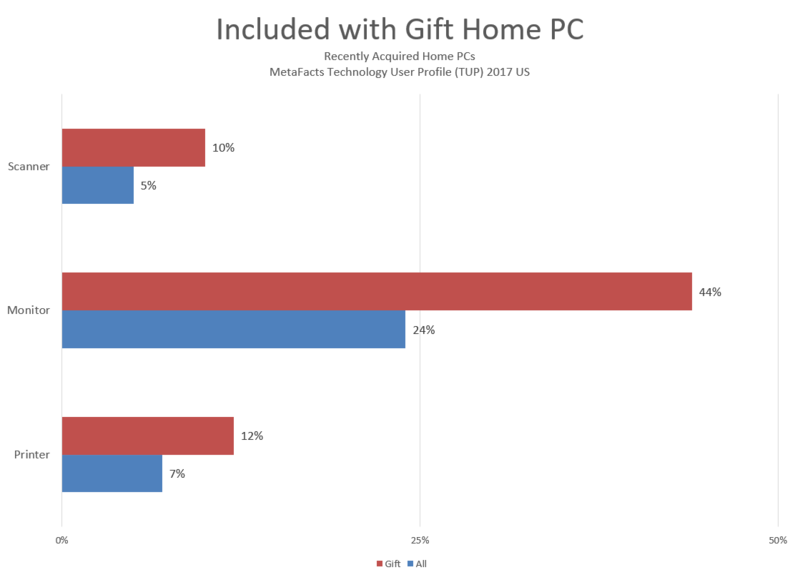 The installed base is still dominated by desktops, representing many years of accumulation and retirement of consumer-owned and employer-owned PCs, some acquired new and others acquired used or refurbished. Of the 144 million PCs being used by American adults as their primary PC, one-third (33%) are mobile PCs, mostly owned by consumers. 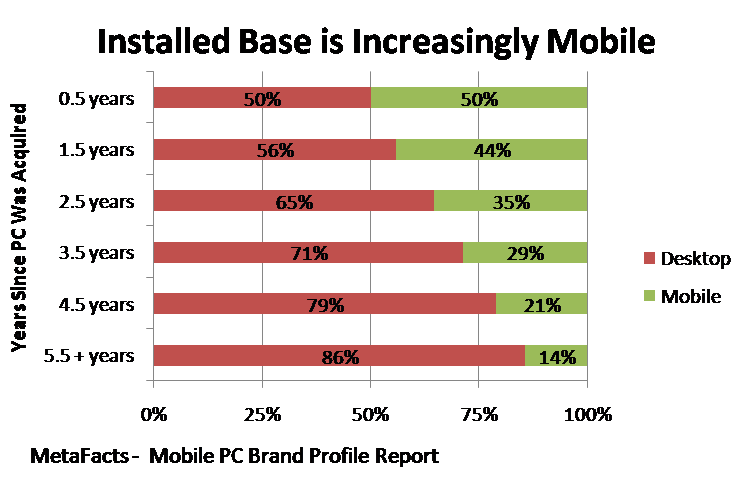 The installed base is increasingly mobile, although still dominated by older desktops. 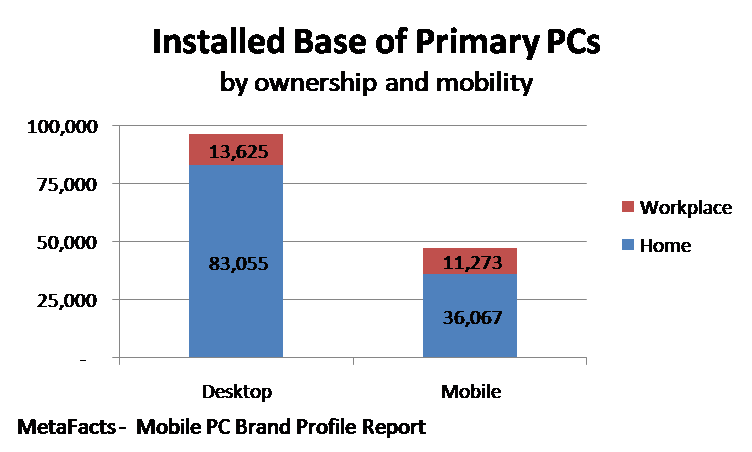 While half of PCs in use that were acquired in early 2008 are mobile, those acquired in the prior 2 years are made up of 65% desktops and 35% mobile PCs. This is due in part to three main effects: an increasing price performance ratio relative to desktops, consumer buying behavior, and the physical longevity of desktops. During the last decade, the functionality and capability of notebooks has increased to meet and often exceed that offered in a similarly priced desktop. This has encouraged buyers to consider notebooks over desktops even when mobility is not a primary purchase factor. Buying habits are also a factor. American technology consumers often buy both hardware and software with more features than they actually need or end up using, as a type of hedge against technological obsolescence and unforeseen needs. Furthermore, mobile PCs, although designed to be mobile, are relatively fragile. This contributes to their life being shorter than for desktops. The average age of a primary desktop PC is 3.2 years, nearly one year longer than the average age of a mobile PC: 2.3 years. Apple’s retail stores are becoming a favorite for Apple’s Home PC customers, and even attracting households without a Home Apple PC of their own. Of all the retail outlets that Apple households have recently shopped or purchased in, Apple’s retail stores rank #4. One-third (33%) of Apple households report recently shopping in or purchasing from an Apple retail store. When including Apple’s online store, this number rises to 43%, ranking it also fourth among most-frequented outlets. We’ve reported this in the MetaFacts Apple Profile Report 2008 based on our surveys of over 10,000 respondents by telephone and online as part of the Technology User Profile 2008 Annual Edition. Any company from PC makers to printer manufacturers and software developers need to keep closer tabs on Apple again. Apple has moved beyond the (PC) box and is finally getting traction in retail traffic. So, it’s important to watch both the Windows-using tire-kickers as well as the Apple faithful. Where else are you more likely to run into Apple-owning shoppers? 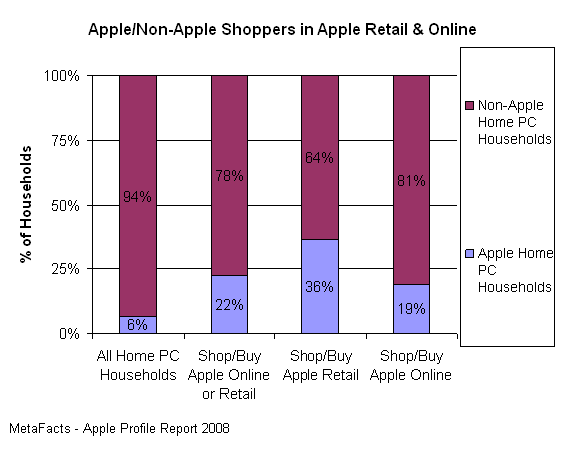 They are more likely than non-Apple households to be found shopping in a Target store than a Wal-Mart store. Interestingly, although Apple households are active shoppers, tech-savvy, and very comfortable and facile online, they aren’t shopping at significantly more online outlets than non-Apple households. They do actively shop online, however. Nearly three-fourths (71%) of Apple households have recently shopped or purchased online, compared with nearly two-thirds (64%) of non-Apple Households. More of Apple’s shoppers frequent eBay than Apple’s own online store. The #2-ranked destination for Apple households is eBay, having recently attracted just over one-third (34%) of Apple households. Apple’s online store pulled in just under a quarter (24%) of these Apple owners. Since non-Apple households outnumber Apple households 94% to 6%, if all else was equal, it could be expected that non-Apple shoppers would frequent Apple’s retail or online stores in similar ratios. That may be Apple’s grand desire, but at this time Apple’s customers have a significantly higher share of their ranks visiting Apple retail stores than their national shares might indicate. This could be looked at as a strong reflection of Apple’s customer loyalty and interest in special programs and services Apple offers in these stores. Alternatively, it could be looked at as some failing on Apple’s part to get wider distribution of its products.Even more interesting, and positive for Apple, is the remarkably high share of non-Apple households that shop in and buy from Apple’s retail stores. Nearly two-thirds (64%) of Apple’s retail shoppers do not have an Apple PC in their household. Also of interest: 4.6 million non-Apple households shop or buy on Apple’s online site, which is nearly identical to Apple’s entire Home PC customer base of 4.5 million households. This is a testament to Apple’s success in driving tire-kickers and concerned Windows XP users and Vista candidates into its stores, as well as customers for its non-PC products, the iPhone & iPod in particular. These high numbers are also a strong and positive indicator of future potential growth for Apple. Beyond everyday consumables and consumer electronics, Apple owners are somewhat unique in where they buy PC-related products. Apple’s own stores are among the top 5 shopping choices among Apple owners, at 13 times the rate of non-Apple owners, even though Sony has a retail presence. Historically, IBM, Gateway, and even Dell have operated their own company-owned outlets and kiosks. These haven’t drawn anywhere near the dedicated attention Apple commands. This is due in part to Apple’s unique and proprietary products, so buyers benefit in being able to get otherwise hard-to-find products. Also, with Apple’s strong brand loyalty, Apple buyers have other reasons to frequent the stores, from their specialized Genius Bar support to One-on-One Apple-specific training. 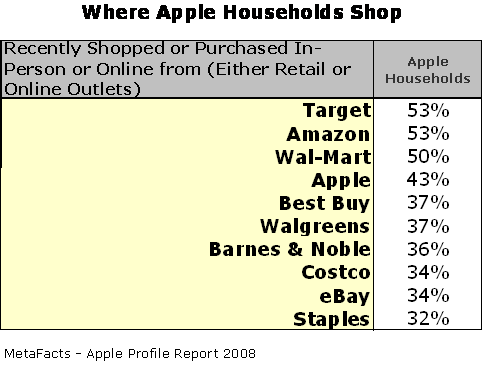 With the exception of Apple’s own stores, the top 5 types of outlets Apple households frequent are the same as those shopped by non-Apple households. There is a wide gap between Apple and non-Apple buyers among discount stores, notably Wal-Mart. For more than one reason, Wal-Mart is less frequented by the Apple crowd: the demographics skew in opposite directions, Wal-Mart doesn’t carry the wealth of Apple-specific products found in other outlets, and in many cases, Wal-Mart is located in other regions, states, and neighborhoods than Apple stores.